Your wedding party deserves a party bus! We provide great bus options for weddings and special party events. 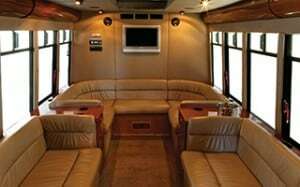 Customers charter our buses to get the most out of their budget, and to comfortably accommodate wedding party guests. A school bus for wedding transportation, you ask? That’s one affordable option, but there’s more! See our party bus types here for photos and more information. Features include air conditioning, stereo and video on our luxury coach buses! Of course, our professionally trained drivers are at your service. Even rent our party buses for bachelor parties, bachelorette parties and bridal showers! Affordable wedding party coach and school bus transportation charters are affordable for groups and get you there in limousine style. Get planning and save with Switzer-Carty Transportation! Contact us for a FREE QUOTE for your wedding day transportation needs! Wedding Party Buses in Your Area! Our coach party buses are available for wedding bookings in areas throughout Southern Ontario, including; Greater Toronto, Mississauga, Brampton, Etobicoke, Markham, North York, Oakville, Burlington, Windsor-Essex County and surrounding areas. School buses are additionally available in Bradford and Simcoe County. For wedding charter bus availability in your area, please submit the online charter request form and we will reply promptly.